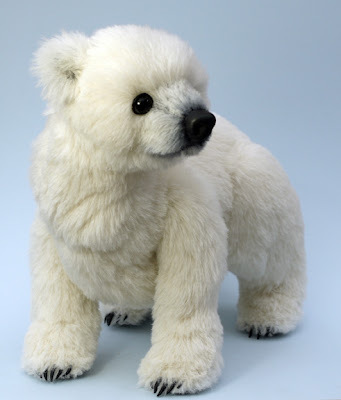 I have just received the news that my polar bear, Pakak, has been shortlisted in the Realistic category of the BBAA. I am particularly pleased as he is my first design using locline. 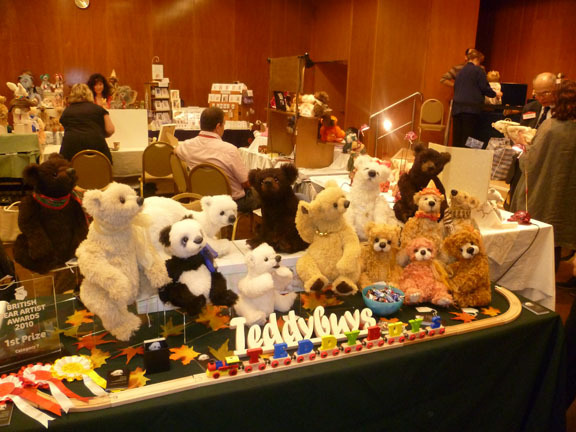 I believe that winners will be announced at the British Bear Show on the 12th November. Is it time to hibernate, yet? 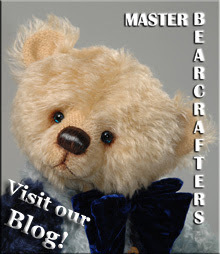 I have recently completed a weekend bear making course at Bear Bits. 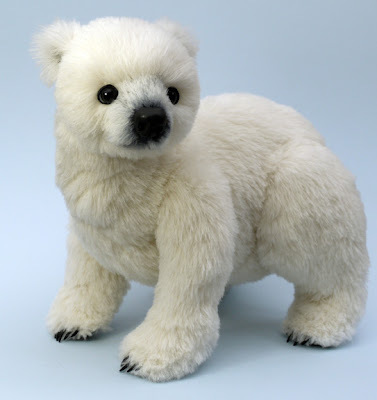 The tutor was Maria Collins of Puca Bears and the purpose of the class was to learn to needlefelt. We had to do much of the sewing prior to the weekend, using the pattern that Maria supplied. I am so grateful to Maria for opening up a whole new area of possible design development for me. I had a really nice weekend with convivial company and Maria was a very generous and patient tutor. I really like the effect that can be achieved with needlefelting on pawpads...although I did discover it does time a considerable amount of time to achieve a nice, 3d effect. I decided to add one of my hand-sculpted noses to the bear's face. I think he looks a little tired, so named him 'Is it time to hibernate, yet?' I'm not convinced he's quite finished. The urge to keep going with the needlefelting needles is strong! 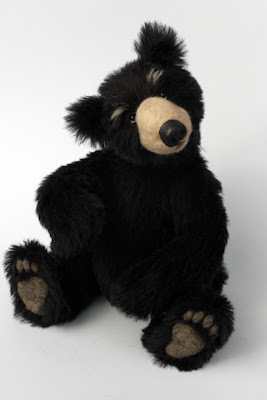 There is still plenty of time to enter the draw for my free giveaway bear, Pumpkin. The draw is not until Halloween. I have been meaning to do a giveaway for some time. Pumpkin is a OOAK sweetie, made by myself. She is looking for a loving home. She is approximately 11 inches tall. She will be posted anywhere worldwide at my expense. All names will be drawn from a hat on the 31st October. For a chance to win her, please leave a comment so I will know you want to be entered into the draw, and become a follower of my blog, or use the image alongside to link from your blog to mine or sign up for the mailing list. 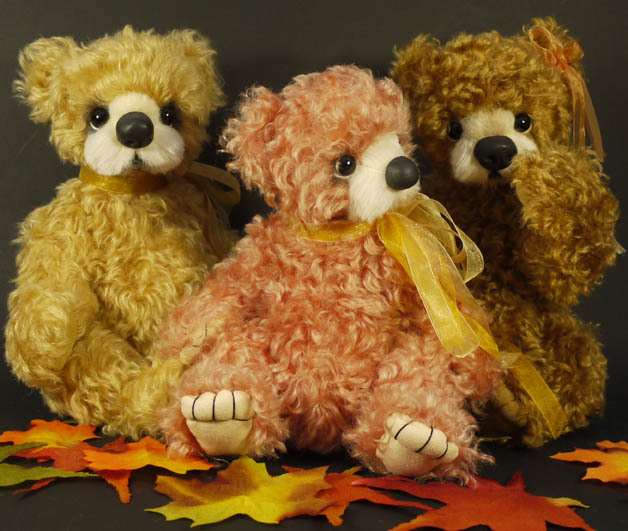 Pumpkin is the middle bear in the photo below! Good Luck! The leaves are starting to turn, the evenings are drawing in and thoughts are turning to preparing the garden for winter. I had a lovely Hugglets, meeting many lovely collectors and other artists. 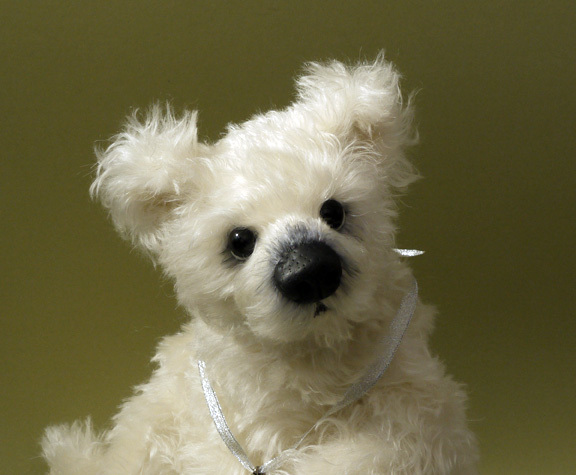 Teddybuys bears found new homes in the UK, Australia and South Africa. I came home with a sore throat! It has taken me 10 days to get around to taking the photos off the camera. The photo below was taken before the doors opened to the public. 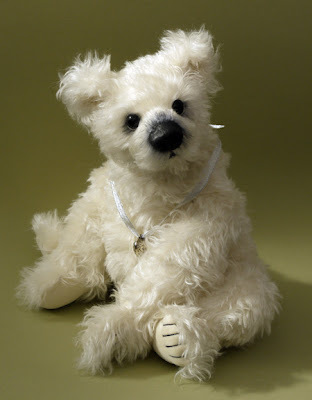 I have just managed to finish one last bear for Hugglets. Charm was photographed unfinished in an earlier post. She is a hybrid between my usual bears and a traditional bear. My usual style bears are made using alpaca. I wanted to use a piece of beautiful Schulte mohair but was concerned that it wouldn't work with my usual dropped paws, so decided to use traditional arms instead. The mohair is very wild and silky. I decided I didn't want to try and tame it, but just left it natural. Anyway, Charm is the result and I hope you like her. Charm is on her way to South Africa. It has been very chilly here the last couple of days. I can only hope that the better weather returns and we get an Indian summer. 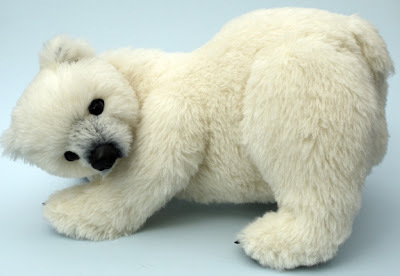 Somehow it seems appropriate that I have just finished a polar cub. His name is Pakak which I believe means 'into mischief'. He has a locline neck and spine with jointed and wired legs. He has sculpted black leather paw pads and epoxy clay claws. His eyes are black English glass with white and black Fimo sclera and eyelids. I have had great fun posing him. I hope you like him! Enough playing around...I still have to get ready for Hugglets. There are bears to photograph so I can create their adoption tags and several of the bears do not have their tails, yet. I'm also going on a needlefelting course in about 10 days and haven't done any of the pre-sewing yet! Does it sound like I'm panicking? Too right, I am!